As the mother of a severely bi-polar, now adult child, like most mothers I have searched my soul for anything I could have done differently. Living without any regrets is a skill which is learned through repetition and in the end when all else has been tried, turning it all over to God. Now more than 40 years later, I can honestly say there is ONE thing in particular I would do differently. I wish that every mother would embrace the wisdom of teaching one basic discipline which is the gift of a lifetime and a cure-all for so many issues children worldwide face. For more than 21 years I have counseled and taught millions around the globe and the one commonality in the majority of people I have counseled is a lack of genuine self-love /self-worth which is often masked by a false sense of ego or arrogance or a sense of entitlement. I have found that the best way to instill a blend of confidence mixed with the right amount of humility combined with compassion and rooted in inner peace, is teaching children meditation. Now hold on there mom, don’t roll your eyes just yet. I am not talking about some babbling guru form of meditation leftover from the 60’s or 70’s. There are reams of medical documentation to support the benefits of meditation and it has little to do with whether you are religious or even spiritual. The more neuroscience has learned about the brain the more doctors have eagerly jumped on the mindfulness/meditation/affirmation bandwagon. Quoting from “7 Health Benefits of Meditation,” “Hard science has caught up: a comprehensive scientific study showing that deep relaxation changes our bodies on a genetic level has just been published. What researchers at Harvard Medical School discovered is that, in long-term practitioners of relaxation methods such as yoga and meditation, far more ”disease-fighting genes” were active, compared to those who practiced no form of relaxation. In particular, they found genes that protect from disorders such as pain, infertility, high blood pressure and even rheumatoid arthritis were switched on. The changes, say the researchers, were induced by what they call ”the relaxation effect”, a phenomenon that could be just as powerful as any medical drug but without the side effects. ”We found a range of disease-fighting genes were active in the relaxation practitioners that were not active in the control group,” Dr. Herbert Benson, associate professor of medicine at Harvard Medical School, who led the research, says. The good news for the control group with the less-healthy genes is that the research didn’t stop there. I have taught all forms of meditation in my two decade career and every race and creed to boot. I have even taught atheists to get centered. Your mind is a generator constantly bombarding you with activity but the soul is a sponge and it absorbs everything it sees and hears in the normal course of a day. Television, pollution, noise, witnessing school playground bickering or the fights you have with your husband, wife or significant other, children and adults are besieged with negative overload. Society has become so angry and vitriolic that quieting the mind and stilling the body just makes good sense. Like a statically charged magnet, if you are always emitting thoughts clarity cannot get in and conversely you will absolutely attract whatever your mind focuses on. How to begin? It’s really simple. Just begin by sitting upright with your child on the floor or in a supported chair. Depending on the age of your child and their circumstances/lifestyle, there are many ways to help support their daily needs. Most children just want to be loved, encouraged, validated, reassured and made to feel safe and secure. When I work with children, I keep it simple and though you do not have to if you choose, I always begin my meditations with a simple prayer….kids love it when you call upon their angels inviting them to join you. Use simple yet affirming soft words and keep it short and always use the phrase “I am” so your child takes your words into the first person. 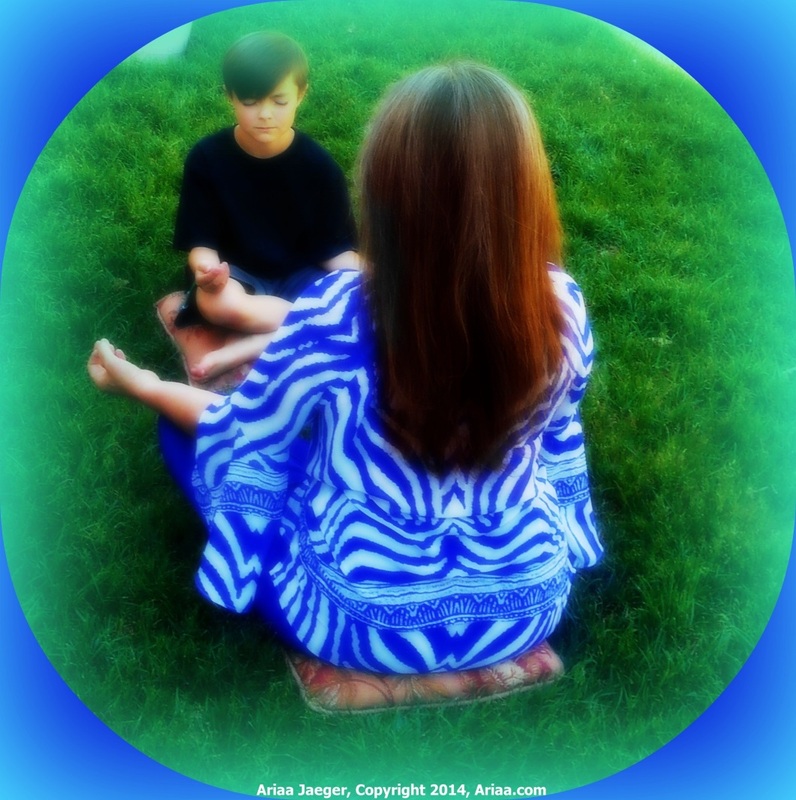 If you are unsure or uncomfortable with leading a meditation you might want to find someone like myself who can guide you but truly I believe all parents have an innate knowing of these very basic principles and am certain you will be guided as to what resonates with your child. I have listed some suggestions below and they can be used in any combination. Encourage your child to deep breathe in a normal rhythm throughout the meditation and use a closing sentence so your child knows when to stop thinking and just breathe. Allow your child to sit for about 10 or 15 minutes in the silence and allow them to open their eyes naturally when they are through. Practice makes perfect and with practice meditation will become as common as taking a nap everyday which by the way I also highly recommend for both adults and children. I have been meditating since 1988 and have not been sick with even a cold for more than 20 years and many have repeatedly remarked that I do not look my age. I am certain that is due in part to the practice of daily meditation. Whether you teach your child to meditate or use some other relaxation modality like Pilates, Yoga, Tai Chi or Qi Gong, learning to be still and quiet is an art form and one which will keep you and yours healthy, happy and whole for years to come. 13. Peace be still, peace be still.